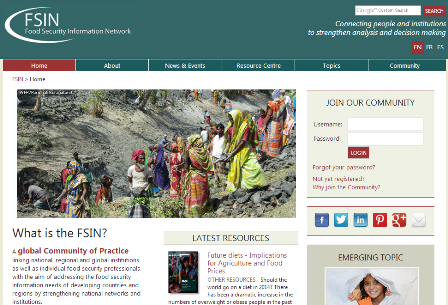 The January 21st, 2014 Ag2Nut Community of Practice call focused on current activities of the global Food Security Information Network (FSIN - http://www.fsincop.net/), a collaborative effort between the FAO, IFPRI, and WFP, with support from the European Union (EU) and the United States Agency for International Development (USAID). Alexis Hoskins, Programme Officer for the WFP Food Security Analysis Service, and Veronique De Schutter, Communications Officer for FSIN, discussed the creation of the network, and highlighted especially its focus on indicators and metrics to measure nutrition as a component of food security and resilience. These topics appear to be a common link between multiple international and country institutions, and the establishment of a new technical working group within FSIN going forward should help advance this work on an international scale.